The landscape of kit suppliers within English rugby league is shifting. A year ago, ISC’s dominance of the market looked virtually untouchable, main supplier to the RFL and in partnership with eight Super League clubs, too. But behind the scenes, changes were afoot… Firstly, two of the domestic games biggest hitters – Wigan and arch rivals St Helens – severed ties with ISC and the RFL followed suit soon after, announcing a new four-year partnership with BLK. The shirt itself is of course predominantly white, but where’s the cross of St George? Using the cross as a big design feature in England shirts for some time, but here it’s nowhere to be seen, though we do get some red trim.It’s perhaps not that surprising, as the 2014 ISC shirt included a cross motif in a very subtle way, but we were hoping that would be a temporary break from what has become tradition for the purposes of the World Cup. 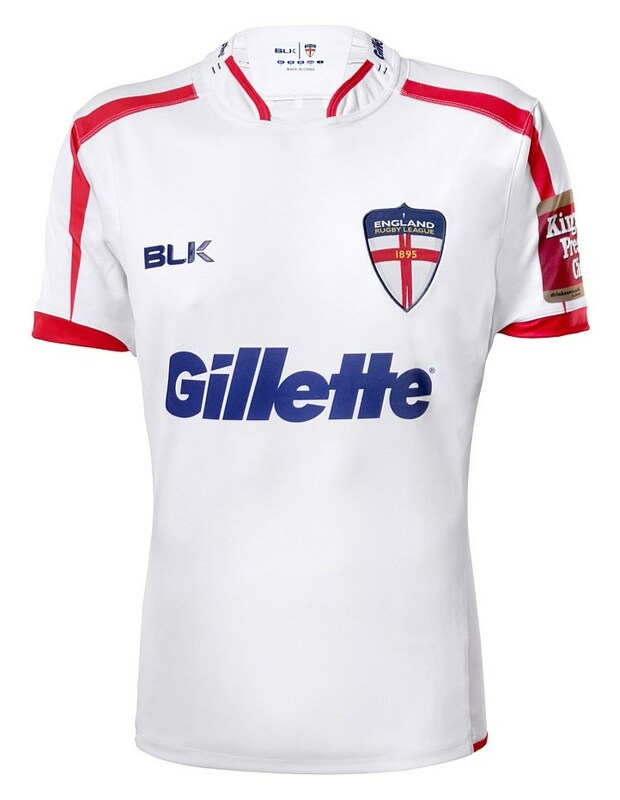 Without the prominent use of the cross, it perhaps takes away some of the uniqueness that past England RL shirts possessed. Sometimes it has featured too heavily, but at least this gave a clear differentiation between the national outfits of the 13 and 15 man disciplines. The aforementioned trim details on this shirt are one of its big plus points, with the neck detail a particular favourite of ours also. Too many collarless shirts are boring and uninventive, BLK have been anything but here, although the red would have looked even better had it continued around the whole circumference, as is the current BLK collar style. 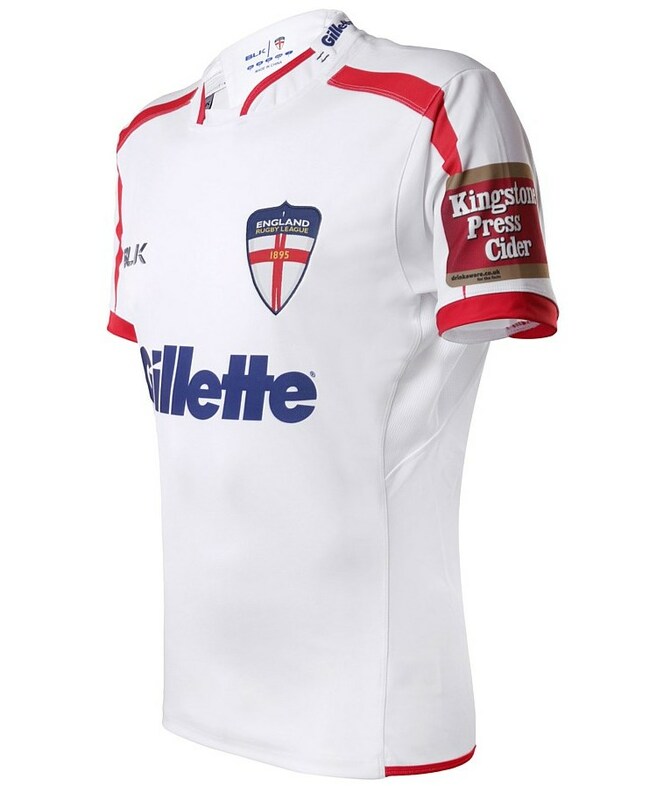 It would be nice if the RFL could ditch their current England crest in favour of a traditional coat of arms, although this seems unlikely and is a real shame as all three main front of shirt components in the same colour would be a touch that only perfectionists could dream of. 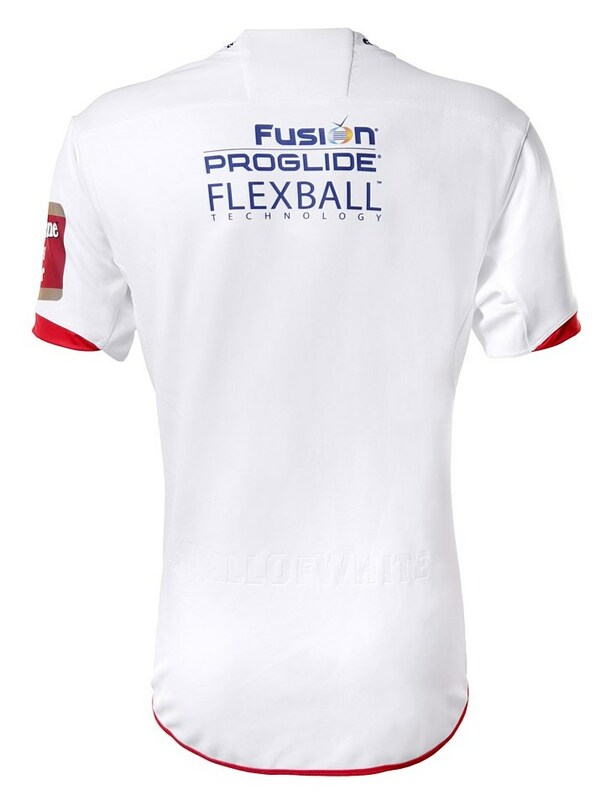 Switch to the reverse of the shirt and here we find a small essay… purists, you may wish to avert your eyes. 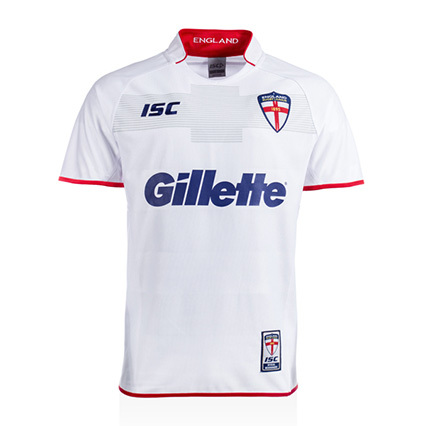 Look, we get the need for sponsors in RL Internationally and for England to keep hold of Gillette for all these years should be commended, but is there any real need to carry a list of all the latest gizmo’s that make up a wet-shave razor? It’s a bit overkill. While it’s an unavoidable part of the modern game and commonplace on club jerseys, we’re not thrilled about the creep of sponsor-overload into an international shirt. For example, we still wish the Kingston Press Cider logo wasn’t obscuring the nice red trim on the sleeve, and if it has to, can it be on both sides so the shirt doesn’t look so unbalanced? That said, the kit designers rarely get any kind of say in this kind of thing, so we shouldn’t hold it against them – it’s a matter for the RFL, not BLK! Here at RSW we always like it when kit makers put thoughtful, subtle little details into a shirt, and it’s worth pointing out the easily-missed ‘Wall Of White’ slogan embossed into the lower back – it’s a nice, understated touch. So have BLK continued where ISC left off? Well in some ways, yes, and others no. While it continues the move towards restrained simplicity of ISC’s final England offering, part of us wishes they hadn’t! We still really like the shirt, but we’re hoping the prominent St George’s cross returns next year. England will never have a realy good Rugby league kit till they ditch the logo & get a proper Rugby League crest I sugest something like Queensland Maroons have crest wise till then all England Rugby league kits will ever be are billbords. As for the jersey itself, the design is kinda tacky even though it’s simple. The make appears poor and the areas where the lines are just look ill conceived – nothing meets and it just makes it look like the design of a non licensed video game.